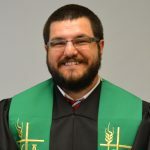 The Reverend Zachary Jackson is the pastor of Community United Church of Christ in Reading PA as well as an adjunct professor of theology at Palmer Theological Seminary. He holds a Bachelor's Degree in Ancient Languages from Wheaton College and a Masters of Divinity from Palmer Theological Seminary. As a child, Zack dreamed of being a rocket scientist, but after being accepted to several engineering schools, he felt an unmistakable call to ministry instead. Throughout Zack's ministry, he seeks to explore how scientific inquiry and the scientific method can inform a more humble, reverent, and honest faith in God. To that end, Zack writes a science and faith blog (http://musicalspheres.blog) and is one of the organizers for the United Church of Christ's Science and Technology Network. He is also on the UCC's Environmental Justice Team and is particularly passionate about how climate change and environmental damage disproportionately impact the poor and underrepresented in our world. We are what happens when the dirt gets a voice, when the earth gets a conscience, when the world has arms and legs and a thinking, rational mind that can relate to the Creator. Answering difficult questions about the world and comforting people in a time of need requires the best wisdom from both religion and science. There’s a reason why this story has become a bit of a flash point between the religious fundamentalists and the atheist fundamentalists in the world. Our lives as we know it are only possible because there is an invisible, counter-intuitive framework woven into the fabric of reality.